IMS Barter is proud to present the businesses that have exceeded $1 Million dollars in sales through the barter network! Welcome to the Million Dollar Club! Since 1985, IMS Barter has helped tens of thousands of businesses save cash, increase sales, and attract new customers. Sure, trade is not for every business, it's just for the businesses that need to increase revenue! 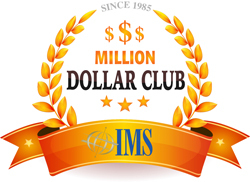 IMS Barter sets out to change the way the world does business, one million dollars at a time! Help us congratulate our Million Dollar Club!